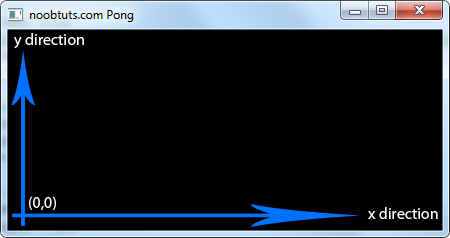 This tutorial shows how to make a C++ pong game in the easiest way possible. The end result are about 150 lines of code in a single source file without any complicated project-, linker- or compiler settings. It uses OpenGL and it works without any crazy math! 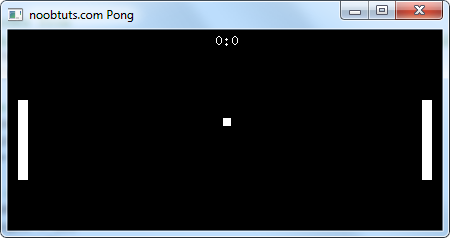 This pong game will be really easy to make (just as we like it). We will go through the process of setting up our C++ development environment, creating a new project and then writing function by function until our pong game is finished. 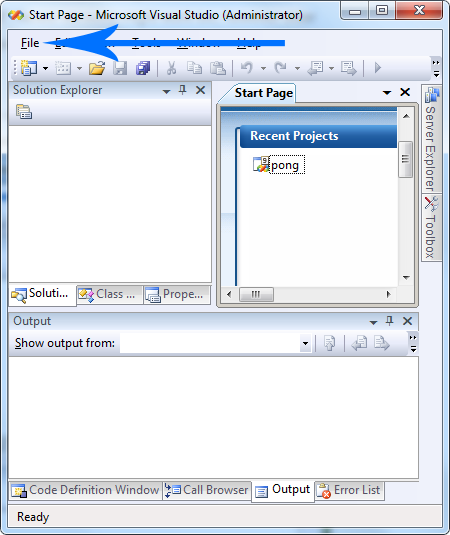 We will use the Visual Studio 2008 Express IDE to make our game. If the link doesn't work anymore, just Google for "Visual Studio 2008 Express Download". Newer versions might work too, however older versions would require a lot of complicated setup so 2008 is the way to go. After pressing OK a new window appears where we press Finish. Our project was now created. Note: make sure to also remove the  brackets behind argv. If we press F5 (or the green play button), the project should compile fine and a black console window should pop up for a second or so. We want to use the OpenGL graphics library for our project. OpenGL is the way to go when it comes to graphics libraries. It works on all kinds of systems (phones, mac, windows, Linux, ...) and once understood it's a lot of fun to work with. To make our lives easier we will also use the GLUT library. It just provides us with a few more OpenGL functions that would be a bit harder to implement otherwise (things like drawing text or creating a window). If we run the project, everything should be fine and the console window should pop up for a second again. Now we can start making the game. Note: if it says "freeglut.dll not found" then also copy the freeglut.dll file to the Debug directory. This is the program entry point, which is just the first thing that happens when we run it. The main parts of any game loop are the update and draw functions. The update function will calculate the ball and racket movement and things like keyhandling. The draw function will just throw everything at the screen so we can actually see something. All we have to do is create them and tell GLUT that it should use them. It will then call them automatically all the time. Those functions already contain a few gl and glut function calls. They are just the standard things that we have to do so everything works properly. There is no need to worry about them too much, as they have nothing to do with the gameplay. We just told GLUT to use our draw function for drawing and our update function for updating. The concept of telling something to call a certain function is called Callback. So when we run the game now, we still only see a black window. But in the background, update and draw are already called all the time (about 60 times per second). Besides that, we also want to draw our ball and our rackets in white, hence the glColor3f function call in there. The glColor3f function takes three parameters, which are a red, green and blue factor. The factors are between 0 and 1. 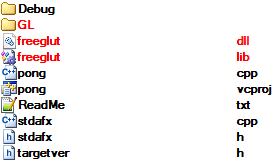 So if we would want to draw everything in red, we would call glColor3f(1.0f, 0.0f, 0.0f) instead. 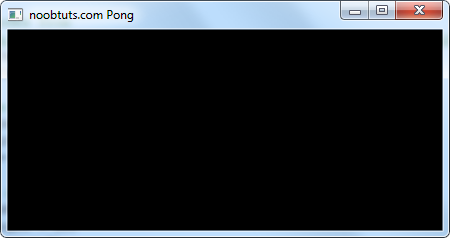 That's it for the OpenGL stuff, now it's time to work on the gameplay! Let's add a score like "1:3" to our game so the players know who is currently winning. This means that the point (0, 0) (which means that x is 0 and y is 0) is at the bottom left of the window. A point like (500, 0) would be at the bottom right, a point like (0, 500) would be at the top left and a point like (500, 500) would be at the top right of the window. Note: if this throws an error when compiling, make sure you included sstream at the top. Awesome, seems like all the OpenGL and GLUT stuff was worth it. Each player needs a racket. One at the left area of the window and one at the right area. Let's implement it! Note: add this to our variables area again at the top, where we also stored the window size and the score. As we can see, the left racket should be at (10, 50) which is at the left of the screen and the right racket should be at (width - racket_width - 10, 50) which is at the right of the screen. We used width - racket_width in order to always have it at the right, independent of the window width (If we would change the window width now, the racket would still be perfectly at the right). The function just tells OpenGL to begin drawing a quad, then it tells OpenGL the four points of it via glVertex2f(x, y) and then it tells OpenGL that we are done by calling glEnd(). That's all there is too it. Lines, triangles and all kinds of other shapes can be drawn almost the same way. It's kinda boring to play pong without the ability to move the rackets up and down, so let's add some keyboard handling. We will use the function GetAsyncKeyState to find out if a key is pressed or not. We will check the W / S keys (for left racket controls) and UpArrow / DownArrow keys (for right racket controls). If they were pressed, we want to increase / decrease the racket's y position. Note: something like a += b is just a shorter version of a = a + b. If we run it now, we can move the rackets up and down perfectly! Let's talk about the ball_dir for a second. The ball_dir_x and ball_dir_y variables describe in which direction the ball is currently flying. For example, if x is -1 and y is 0, this means that the ball is flying straight towards the left. If x and y would be 1 this would mean that the ball is flying towards the top-right. Please take a look at the OpenGL Coordinates picture above if there is anything unclear about this. Since we already have the ball's fly direction all set up in our ball_dir_x and ball_dir_y variables, we don't have to do much in order to make it fly to the current direction. It simply increases the ball's position by its direction multiplied with the speed. No crazy math to it, just one multiplication and one addition. Reminder: the update function is called about 60 times per second because we set it up as a callback in the GLUT library previously. Note: as mentioned before, a += b is just a fancier way of doing a = a + b.
Alright, the last part of our game takes a slightly bit more math, but still nothing that we didn't learn in school already. Collision with left racket: let it fly to the right and set the y direction depending on where it hit the racket (so it also flies up and down and not just to the left and to the right). Collision with left wall: increase right player's score and reset ball to the center. Collision with right wall: increase left player's score and reset ball to the center. Collision with top wall: invert the ball's y fly direction). Collision with bottom wall: invert the ball's y fly direction). // hit by left racket? // hit by right racket? It's really simple actually. Every time we just check the ball's x and y values to see if it's inside the left racket, inside the right racket, above the top wall, below the bottom wall, left of the left wall or right of the right wall. Then as explained above, we change directions, increase scores and so on. We also used a t variable at the racket collision parts. This one just specifies where exactly the racket was hit, so we can change the ball's outgoing direction depending on where the racket was hit. Then there is the vec2_norm function call at the bottom. We need it because we modified the ball_dir_x and ball_dir_y variables before. But in order to have the ball flying at the same speed all the time, the sum of both of those variables should always be exactly 1. That's pretty much what vec2_norm does, it just sets the length of a vector to one. Now the sum of those two is exactly 1, while the ratio (or in other words, the fly direction) remains the same. Its not too hard to understand each line of it. It just calculates the squareroot of the sum of the squares of x and y, then divides and multiplies things a bit. Now don't worry, this is not some crazy magic that we just invented, it's just a formula that can be found in any math book that covers vector math. Make sure to give the whole vector math thing a read one day, because there are a lot of cool things that are used in games every now and then. If we launch the game, we can now see the ball colliding with the walls and the rackets just as we planned it. That's how to make a game in C++. A rather long tutorial, but in the end it's just about 150 lines of code. As usual, our goal was to keep things as easy as possible. There are a lot of improvements that can be done to this game. Examples are sounds, a vector2 class or some nice particle effects and shaders. Maybe even AI for a computer controlled enemy. 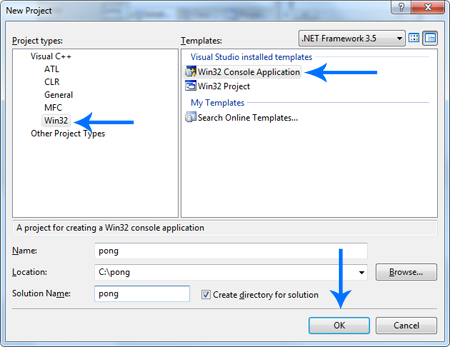 The C++ 2D Pong Game source code & project files can be downloaded by Premium members.